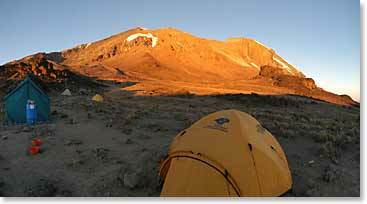 Welcome to the Berg Adventures Kilimanjaro and Tanzania Safari expedition starting on July 5, 2008 till July 27, 2008. Our team, which includes two families, will be climbing the Lemosho Route which is on the western edge of Kilimanjaro. Join us on our adventures as we attempt to climb Africa’s greatest mountain and then continue on with our famous six day safari through the Serengeti. July 15, 2008 – Celebrations on the Highest Point in Africa! July 14, 2008 – Entire Huffines Family on the Summit! July 6, 2008 – Huffines Family Arrives in Africa!